Swap a traditional tomato sauce base for pureed sweet potato, and you’ll get a boost of eye-helping vitamin A! 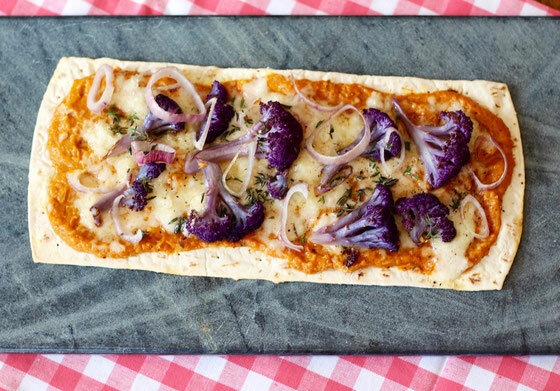 This flatbread pizza is beyond delicious. Over my many pizza-loving years, I’ve enjoyed traditional pizzas with tomato sauce, as well as white pizzas and ones drizzled with pesto. But when I started thinking about how to add extra nutrition to my pizza, I realized I’d never had a pizza with sweet potato. So I set out to create a tasty and nutrient-rich version! I used a base of Flatout Rustic White Artisan Thin Pizza Crust, which is just 130 calories and 4 Weight Watchers ® SmartPoints ® values—and filled with 5 grams (10 percent of the daily value) of filling protein. Did you know that several Flatout flatbreads and pizza crusts are now endorsed by Weight Watchers for between 2 and 4 SmartPoints values per flatbread? 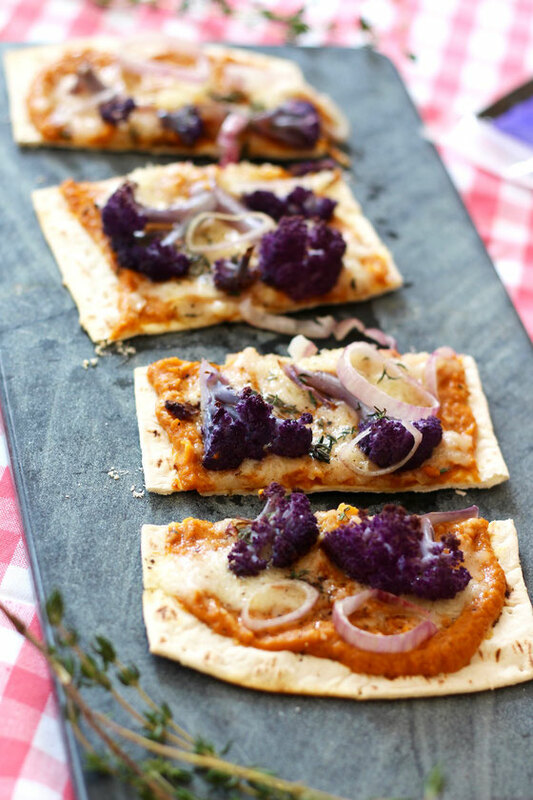 I topped the flatbread with sweet potato puree (which I spiced up with ground chipotle), as well as shallots and cauliflower. You can use any cauliflower you desire, but I chose purple for a boost of color, as well as nutrition from the antioxidants that give the cauliflower its color. Then I topped the pizza with Fontina cheese and fresh thyme. The sweet potato adds a boost of eye-helping vitamin A, plus satiating fiber. 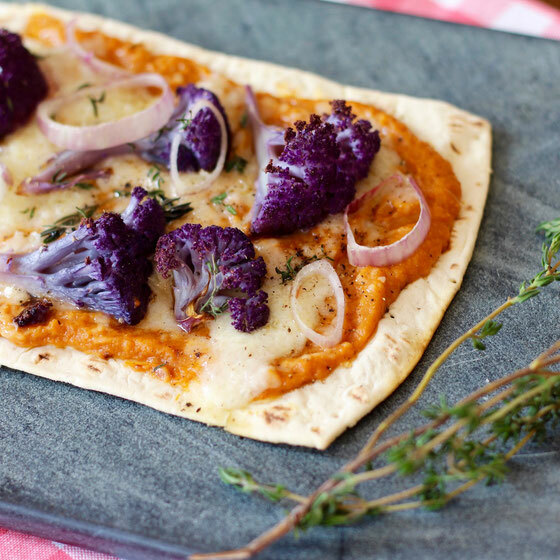 And the cauliflower provides immunity-helping vitamin C.
I had this pizza for lunch with a side of roasted veggies—I roasted extra cauliflower to serve up! The combo was super delicious, and I’m thinking of whipping it up again soon for an easy gourmet meal that I can serve up for my boyfriend and I.
Preheat oven to 425° F. Treat a non-stick cookie sheet with cooking spray. Place cauliflower pieces on tray, and coat with spray oil. Roast 20 minutes, turning once. Remove, and place in a small bowl. Re-coat cookie sheet with cooking spray. Lower oven temperature to 375° F. Place Flatout pizza crust on sheet, and bake for 2 minutes. Meanwhile, combine sweet potato and chipotle in a small bowl. Remove pizza crust from oven, and spread with sweet potato mixture. Top with cheese, cauliflower, shallots, thyme, and black pepper. Bake an additional 4 minutes. Slice, and serve immediately. Serves 2. What are your thoughts on this topic? What are your favorite ways to add veggies to pizza?